paisley filled new line out! It has the greatest bucket list print! This picture and the one above are from Sweetwater's blog. but they look awesome in person. leave a comment about something on your bucket list! shipping prices! Postage goes up on the 27th. I'm trying to get more added in! Noteworthy is yum. Bucket list - I have wanted to learn how to make a chocolate souffle forever so it is on my bucket list. To make 'a' quilt was on my bucket list in 2009 so I made one... then carried on! SO many things on my bucket list!! its a very good thing i'm young! ;) One of those things is to Learn how to fly a plane!! This line is so gorgeous. Love the color combination and there's not one fabric by itself that I don't love!!! On my bucket list is to run a marathon. Or at least a half! I would love to go visit all the historic sites in the US in an RV. It would be so much fun. one of the top things on my list is to visit New York. A trip to New Zealand is top of my bucket list! I think that fabric is beautiful. I would like to go to a test match (cricket), between England - Australia. I'd love to spend a month traveling around France! What I`d most like to accomplish on my bucket list. That would be buying a few acres of mountain property from my son and DIL and building a small cabin there. It`s close to Grand Canyon and gorgeous. What a great giveaway, in my bucket list... a few more trips and places I want to visit! Thanks for the chance to win. One of the things on my bucket list is to make a quilt totally by hand. Hand piecing, hand quilting etc. I think when my children are older, we will definitely go, hopefully with some of our friends who are real foodies too and their company is fantastic. As it is I just buy Hestons food from Waitrose, even that is amazing! What a fun line! Making soap is on my bucket list. I want to o to Hawaii and Alaska. I want to spend a few weeks in each one to really enjoy those places and see as much as possible. Thank you or the chance. Israel -- visit Israel is on my bucket list. Of course, I don't even have a passport, and it seems so inhospitable to American visitors now. Still . . . it's there. On my bucket list is to become a grandma. Not yet, but someday. On my bucket list is to finish some BOM's that I have had for sometime. There always seems to be another pattern out there to make, however. I would love to have a house with a front porch facing East, so I can watch the sun rise in the morning. =) Thanks for a lovely giveaway. That fabric looks like it would be such fun to create projects with. Thanks for the giveaway and the chance to win. I want to go on a world tour and see all the amazing places I have read about. And now with the blog friends I have made I would love to have a coffee with all of them too. And quilt my own quilt just once! I want to visit major landmarks in the US! That's a beautiful line of fabric. Thanks for the chance. I love all things Sweetwater! On my bucket list- I've always wanted to visit British Columbia! Looks gorgeous- gotta love those beautiful mountains! This years bucket list item is to visit all the Marshall Fredrick sculptures in Michigan! thanks! Since I have had cancer nine years ago I now go with the attitude that no one tells me what to do and my husband and I go on a trip every year instead of waiting until we retire. We leave next week for our new adventure. We are having a funeral for my father n law today who is 86 and I pray that we will do as good as he has over the years. Life is good and I have a great family to spend it with. I have some quilt tops that are almost done. I hope to get them finished this year. The one thing on my bucket list that has been there since I was a child is to parachute out of an airplane. I was planning to do it before 50 - but that has passed. I hope to do it before 60. LOL. It sounds crazy for someone who is afraid of heights, but I love to go for a ride on an airplane and have even ridden on an ultralight (a plane where you are sitting on a seat in a plane with no body - the wind blows thru your hair. It is amazing. So I can only imagine at this point how wonderful free fall would feel. Oh, there are lots of things, but one major thing would be to run a marathon. I have quilt bucket list - and the top one on that list is a spiderweb quilt. Thanks for the chance to win! I want to see the Redwood trees in California :-) Thanks for the chance to win! You really must've them. We did on our way to Arizona last year--wow! I want to o back and camp for a week and just wander around among them. I would love to take a trip to Wales. wow this fabric collection is amazing!!! i'm just asking my self what can i make with this.. because i have to sew something!!! so beautiful thank's for the giveaway... for your question.. what's a bucket??? (sorry my translation in french is not good this morning!!!) have a nice day! There was a movie that came out a few years ago about two men that were dying, and they kept a list of all the things they wanted to do before they died. hmm. I don't know what something on my bucket list would be, I have already fulfilled a lot of them, I went to France(/Europe), I got married, I have started traveling the US. My bucket list....I have travelled a little; just a little. not going away this year, because I can't seem to decide on anything. I would love to go to Hawaii, but it's such a long flight; so I keep holding back. Other than that; I want to get better at FMQ..this past year has helped me a lot by taking the Challenge with SewCalGal; but I need more. Yeah, I too would love to be able to be brave enough to quilt one of my own (smallish) quilts but I seriously doubt that will ever happen. Just so much easier to send off to the longarmer. Bigger bucket list? See if I can get one of my friends to go on a cruise to Russia with me. HA! Thanks for the giveaway. I've got a list of cities in the US I'd like to visit - Seattle, Denver and a few others. And I always like to find the quilt shops! Love Noteworthy and Sweetwater. Text prints are so much fun! 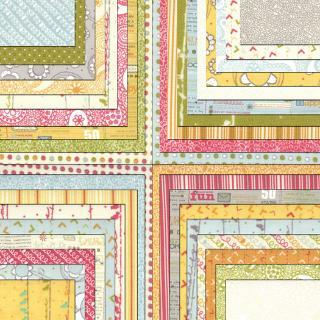 On my bucket list is a hand-pieced and quilted hexi quilt. Thanks! Gorgeous!My bucket list is to visit Australia.That`s a wish and in my quilting list is to finish almost two quilts. (I hanquilting). Adorable! Would love to take an Alaska cruise. My bucket list is to finally make a quilt for my guest room. Cute! 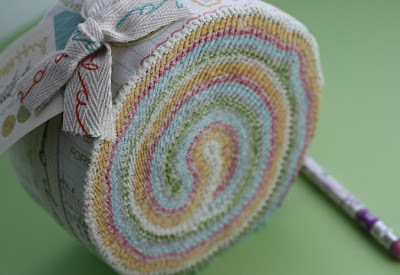 I don't really have a bucket list but I'd love to sew up most of my enormous stash!! To visit "Mood" in New York City! Thanks for the chance! I love the new fabric line. To visit Alaska is on my bucket list. On my bucket list is a visit to New York City and have a pastrami sandwich there! Seeing the ocean is on my list. I've been drooling over this fabric!! What's on my bucket list? To just take some time off from everything and travel for awhile. Without a plan or a reason. Just to get away and enjoy. Being that I am a planner and I like to know what's going to happen next, this would be a trip outside of my comfort zone, but it would be lots of fun and good for me to just wander around :-) Not likely to happen anytime soon, although it's fun to dream about! Top two things on my Bucket list are a visit to a certain quilt shop in America and a meal in a restaurant in Santa Rosa. Both will hpoefully be on in 2014. On my bucket list: a trip to Israel! Thanks for hosting the giveaway! I think a trip to Europe is on my bucket list, as well as mastering machine quilting! Who knows when! Very cute charm pack! Harry Potter World is at the top of my bucket list. Pretty sad for a 42 year old woman...right? I don't care. In March I and my family are moving to Florida and we'll only be two half hours from Orlando...YAY! Travel to Europe, learn french, and mastering the Piano at concert level. A trip to Italia! Oh to drink wine and enjoy some food in the company of my DH. Wonderful fabric line! Thanks for the giveaway. A trip to Thailand is on my list! Love the fabric. On my bucket list is to make a Grandmothers Flower Garden quilt. Thanks for the giveaway. The top thing on my bucket list is to do a Lone Star quilt in solids. On my bucket list: designing and building my dream house. My sewing bucket list includes making myself some wearable piece of clothing (not a scarf!). So far, I have the pattern picked out and the fabric purchased. My bucket list has curves written all over it! On my bucket list is to finish up ufo's so I can start new projects! I'm having a hard time coming up with a bucket list item that is original but still reasonable. So I'll go with the least reasonable one- sky diving! 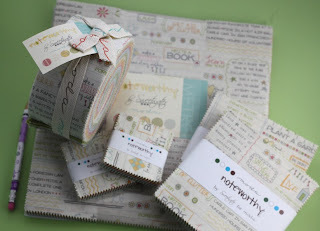 Thanks for the giveaway- Noteworthy is such a fun line. One thing on my bucket list is retire one day soon and have time to travel! My bucket list includes running the Great Wall of China marathon in Beijing. One item on my bucket list is to go on a zip line. Thank you for offering this great giveaway. Europe. I love Noteworthy. Thanks! I really want to go on an African Safari! Go to Spain with my husband when the Giro is running. And to France - the mountains. One thing on my list, that hopefully will happen in the next couple years, is to visit Hawaii for 2 weeks! 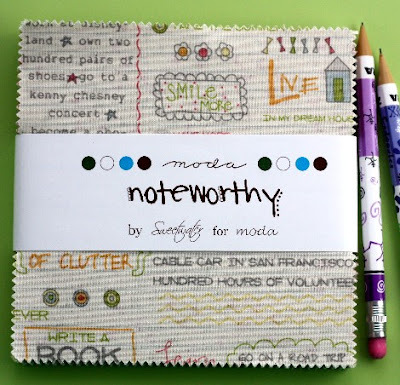 I love Noteworthy too!! Thanks!! Oooh this is delightful fabric. My bucket list..I want to take a cruise with my husband. He is retired Navy, and I was in the Navy too, but never spent time on a ship. I'd like to go to the Caribbean somewhere and delight in the warmth of the sun. Ahhh yum. I just can't separate myself from my children. Terrible I know, but I'm SOOO a mom. Someday I want to live in one of those earth sheltered homes that use passive solar energy. Like my own little hobbit house! Maybe when DH retires. I like the bucket list I heard this week by a preacher of God's WORD.......to help One more person before I die. Yeh, I think I'll hope to accomplish that, praise God ! I would love,love,love some Noteworthy!!! I would love to visit the East Coast of Canada and US! Also love the fabric! I want to visit Greenland. Just because not many people can say they have. My bucket list is out of control. Never, in my lifetime, will I ever do it all, but who cares? I'm having fun. This year I want to do a Dresden Plate quilt. Bucket list: travel to France! One of mine is to visit all 50 states. I have 12 left manly the southern and mid-Atlantic, central area of the country. I just love anything from Sweetwater! LOL! I, too, would love-love-love some Noteworthy! 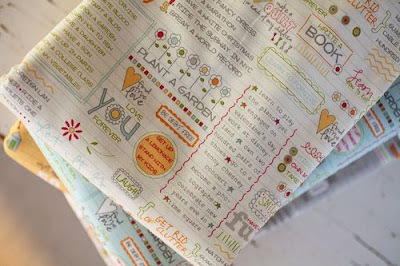 Words on fabric really make me happy. My bucket list item is a bit embarrassing: It's to clean and organize my sewing area - and SOON. I'm not one for maudlin thoughts but occasionally, as I'm leaving the house, I catch sight of my sewing pit and think, what if I'm in an accident and the Mr. has to deal with this mess? I'd prefer that he remember me fondly rather than what I'm afraid he'd say if he had to wade through all the :ahem: treasure in my sewing room. My bucket list includes visiting the six states that I haven't been to in the contiguous US and to see an iceberg calving from a glacier. Oh, and figuring out a pattern for an antique quilt that no one can identify. Almost done with that one. Great fabric! On the bucket list - go to Europe! One day I would like to visit Amsterdam, the towns my grandparents grew up, visit a fresh market with all the European foods I love, and visit a bunch of famous landmarks in that area. I would love to marry Keith Urban but I don't think his wife would let that happen! So second on my list is to see Bryce Canyon. That one I think is possible at least!!! 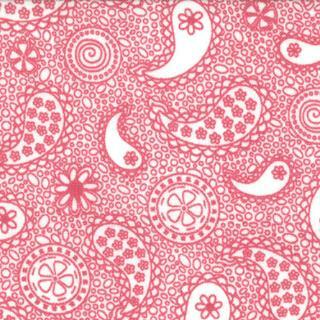 Super cute fabric!!! Something on my Bucket List is to read the Book of Mormon in a language besides English. What language, no clue. :)Hope you have a fantastic day!! HI! HOW ABOUT OWNING SOME "NOTEWORTHY"! Scotland and Ireland. On my quilting bucket list--one of Judy Niemyer's incredible quilt patterns. 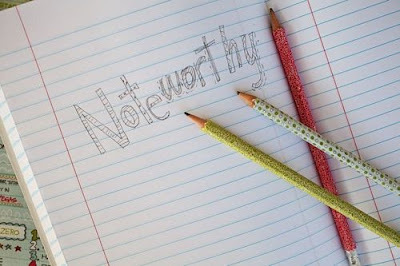 Noteworthy is wonderful and soooo 'texty' and 'texty' is "IN"!! I hadn't heard about postage rates going up. I did a search and couldn't find an article about it-I'll keep looking. Thanks for the heads-up. On my bucket list, a trip to the countryside of England. Love the Noteworthy collection. Would make a lovely spring quilt. I would love to go to Hawaii! 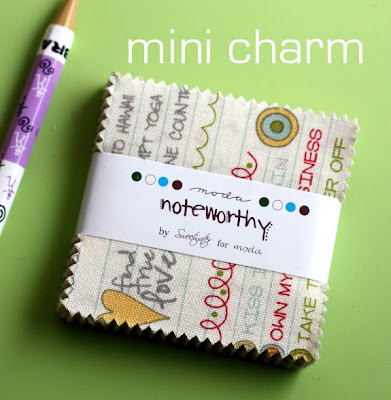 Thanks for the giveaway-Noteworthy is adorable. Visiting Japan is definitely on my bucket list! Thanks for the giveaway! I have an 8 page bucket list that I've been working on for three years now. My favorite thing that I've done so far, move somewhere new because you can. (We moved to Seattle, Washington) Simply because we could. A funny, super silly one, that we just added is to walk around a park eating vanilla pudding out of a Mayo jar. Love you giveaways, but mostly just love reading everyones comments! Hawaii is on my bucket list -- more specifically, Maui. Thanks for the giveaway! Someday I'd like to go to Disney World. Thanks! My travel bucket list is so long! Going to Germany is at the top. On my bucket list for this year is to make a cathedral quilt. Absolutely LOVE Noteworthy - especially the bucket list prints! Crazy as it may be - going to Quilt Market - is on my bucket list. To travel up the Pacific Coast into Canada with my husband after retirement! Thanks, as always, for the generous giveaways! Tops on my bucket list is to live near the ocean again. Thanks for a great giveaway. I love Sweetwater! Finishing up all my UFOs before I kick the bucket would be nice! I want!!! Hmmm Bucket.... learn Point, I dance but have been on a break from it and I have always wanted to advance to point..
Bucket list is to finish my Farmer's Wife Quilt Sampler. I have a trip to Europe and the UK on my bucket list. I would love to tour Europe! Thanks for the chance - Noteworthy is a favorite of mine!! Would love to finish those few quilts that just need backs yet. Thanks for the giveaway. The only thing that was on my bucket list was to make a quilt. Looks like I need to add something new....hmmmmm. Maybe finish (like in quilting) another one. 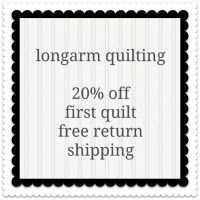 I want to start selling quilts on Etsy. Hopefully this year. I LOVE LOVE LOVE this fabric, by the way. I added to my favorites on Etsy just yesterday! My bucket list!!!! Maybe I should make one!!! Right now would be to keep trying to learn to quilt!!! Not give up!!! Try try again!!! The fabric is very pretty!!! Thanks for the chance to win some!!! I would love to rent a winnebego and travel across the country, seeing sites, kayaking and hiking at all of the national parks, lol. On my bucket list are three quilts to finish. They only need to be quilted and bound so I have decided to not start anything new until they are done. That will give me the incentive to finish them. I'd love to adventure around Europe. Maybe for a month or so. We'll see if it ever happens. An item on my bucket list is to see my daughter have children of her own. I want to get to Scotland and Ireland for a long vacation with the husband and my camera! I've actually done several things on my list. I have lost both my mom and my sister when they were young so I decided then not to wait longer than I needed to to start doing things I wanted to. I'd love to spend at least a month at my mountain cabin in the summer. It might be attainable sooner than later. I love Noteworthy! Some thing on my bucket list is to visit Paris in the summertime. I've been there in late fall and now I want to see it in full bloom! I would love to be able to take my kids to disneyland when they are bigger! on bucket list is a trip to Italy. someday I hope. Italy is on my bucket list too! Someday I would like to attend the Sewing and Quilting Expo held in Washington state. It may have to be a few years down the road, but I'd love to soak it all in. Top of Bucket List: Go to Italy! Travel the world! I love Noteworthy. Thanks for the chance to win. My bucket list number 1 is build a new house. We bought some property and have a plan. Now to sell the house we are in and get the financing lined up and we will be ready to go. My bucket list ~ Help my granddaughter make a quilt for our local fair for a 4-H project. 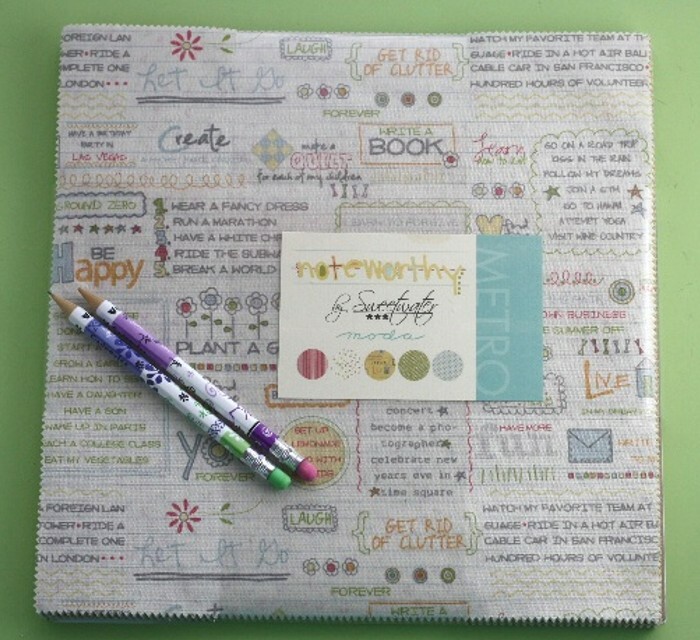 Love the Sweetwater fabric ~ that may be the fabric to use since she loves to doodle. I'd love to visit Italy or Australia. Thanks for the great giveaway - a very fun set of fabrics! 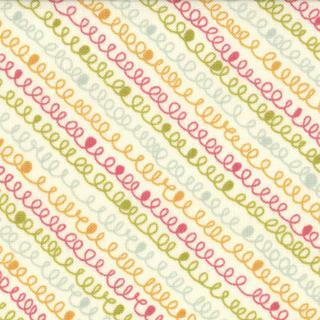 That's really cute fabric - so bright & cheery! I have a bright & cheery bucket list item to go with it - hubs & I want to explore Hawaii, Australia & New Zealand. Not necessarily all at the same time - they're just where we want to go! A Caribbean cruise with hubby is on my bucket list :) He'd rather stay home or go to Alaska though, so the bucket list completion may be a long time coming, hehe. I want to make a Christmas bed quilt for each of my children. I have about 4 quilts to finish that are on my bucket list. I want to finish my UFOs! Thank you for the great giveaway. travel around the US, now that my hubby & I are now retired. end of this year. Thanks for the chance to win! That is so cute! I will be buying some of that to make my 10 year old daughter something out of, she will love it. As for a bucket list, coincidentally enough my daughter and I were in a car wreck Tuesday that scared her and I both pretty bad and I have been thinking of a bucket list ever since. One of the things on that list is to move back to my home state of Texas. I just love this line. 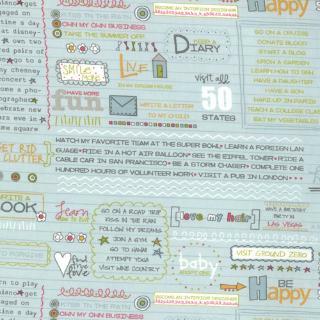 Those text prints are adorable....I'd hate to cut them up! One thing on my bucket list is to run a marathon. Thanks! I want to stand inside the Pantheon someday. Thanks for a chance to win a gorgeous charm pack! 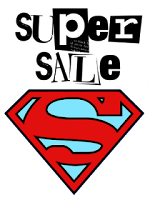 To go to ComicCon! 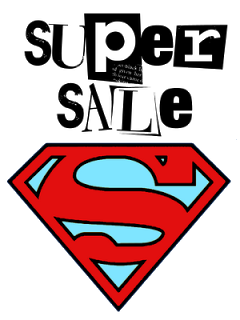 I'm a really big geek. I want to go to Vermont in the fall. I would love to visit DisneyWorld during the winter holiday season sometime. Most of the items on my bucket list are realistic and achievable but I have one item on my list that is greater than me and my abilities. I'd like to have dinner at the white house with a president and his/her family. I have no political motives, just something I'd like to do. I am waiting to go to the Grand Canyon this Spring. I am 67 and it has always been on my Bucket List. Eating only pastries for a whole week! 2 things on my bucket list... Noteworthy fabric..I saw it couple months ago when it first come out...haven't been able to afford it yet..but working on it! Second...a cruise to Alaska and about a month or two to explore it! Wow...my bucket list. I would love to travel Europe extensively and find my father's family in Sweden. I would also love to just once buy all the fabric my heart desires without worrying about cost. I would love to go to Hawaii with my husband for a couple of weeks and not have to worry about the cost.